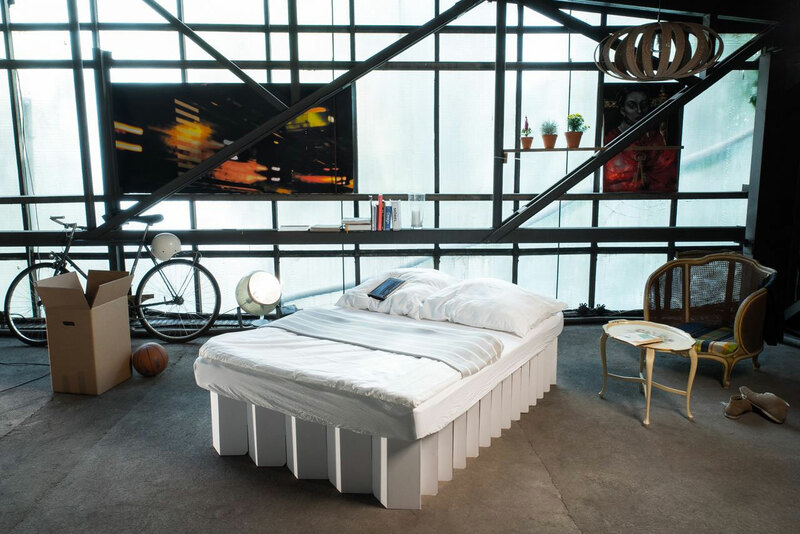 The Room In A Box is the eco-friendly bed you can assemble and put away in seconds. 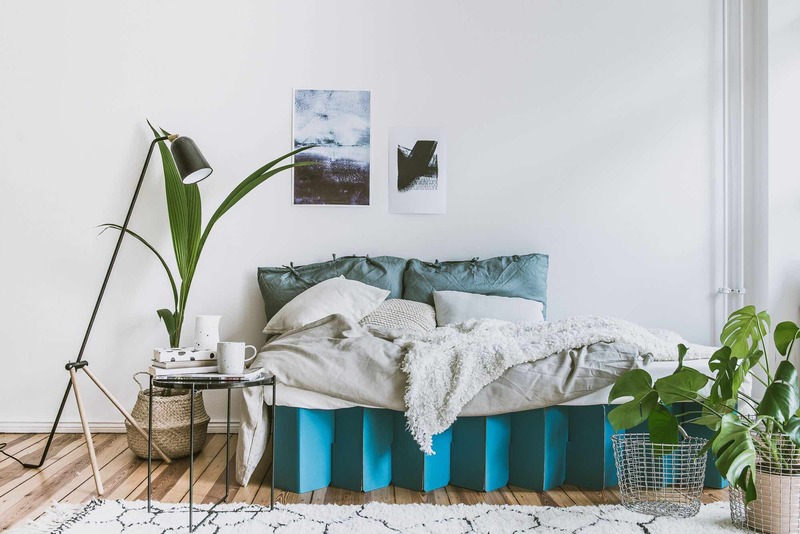 This lightweight, stylish cardboard bed is exclusive to Happy Beds and will give you a good night's sleep in the most convenient way possible. Room In A Box bed is available in four finishes: natural cardboard, white, black and blue. Unique in appearance, functionality and availability, the Room In A Box Bed is an utterly charming bedframe that's as brilliant for the bedroom as it is for the environment. An exclusive product, the Room In A Box Bed is only available in the UK from Happy Beds. 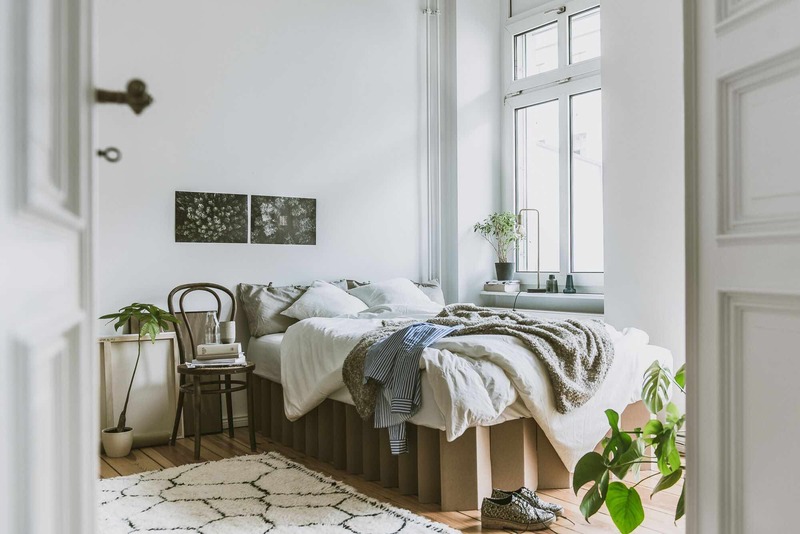 Perfect for environmentally minded individuals and adaptable to essentially any style of decor, the Room In A Box Bed serves not just as a strong statement piece but as a beautiful bedframe by its own merit. Ready to sleep on within seconds of being out of the box, the Room In A Box Bed arrives in a flat-pack format yet requires absolutely no assembly. It's merely a case of pulling the frame out to expand it, followed by placing a mattress on top of it. A far cry from even the quickest construction processes for conventional bedframes, the Room In A Box Bed is hassle free. 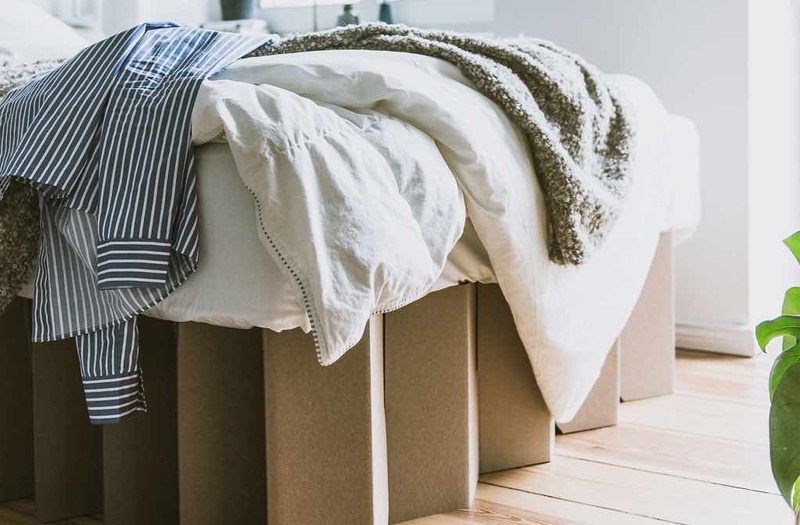 Thanks to this wonderfully simple assembly process, going from box to bed and back to its flat-pack form takes little to no time at all, making the Room In A Box Bed an exceptionally convenient choice. As the Room In A Box Bed is made with AVANA corrugated cardboard it is 100% recyclable, making it an eco-friendly choice. The material is made with a minimum of 70% recycled paper fibers. Any remaining material comes from sustainable forestry, making the Room In A Box Bed completely green. The Room In A Box Bed is also completely vegan friendly, which isn't usually a term one would associate with furniture but it's appropriate with this bed. 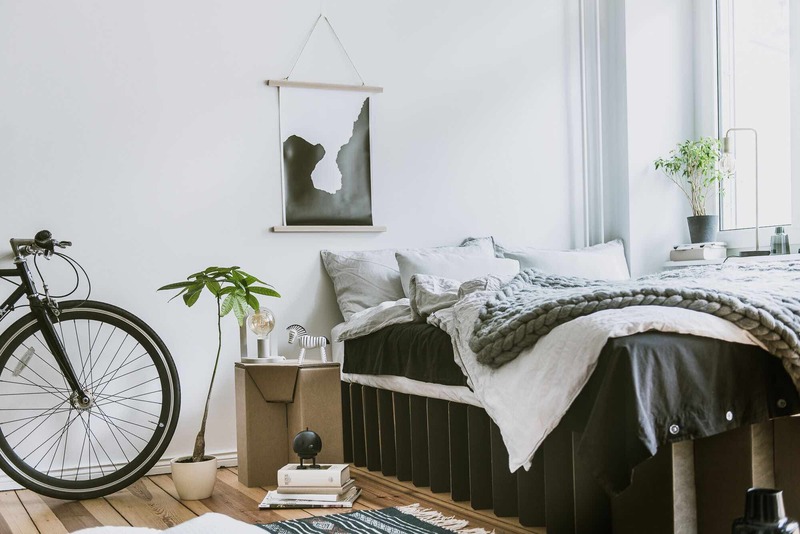 As well as the recycled cardboard used for the bedframe, the glue used to bond the frame is made entirely of animal-free ingredients, such as corn, wheat and potato based starch glue. As well as being dedicated to utilising primarily recyclable materials, the Room In A Box Bed focuses on avoiding materials and construction processes that are harmful to both humans and the environment. Chemical free materials and fully automated production lines keep the entire journey for the Room In A Box Bed ethical and safe. 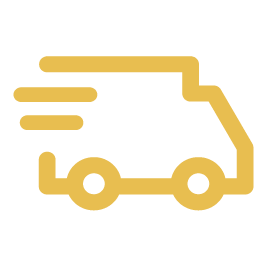 The literal journey of the Room In A Box Bed is sustainable as well as the exclusive courier service, DPD, are committed to lowering CO2 emissions as much as possible when they deliver their packages across the world. Of course, this includes when they ship the Room In A Box Bed, all whilst keeping the service completely free. A lightweight yet durable material, the Room In A Box Bed is made using AVANA corrugated cardboard, a type of cardboard designed to maximise resilience. 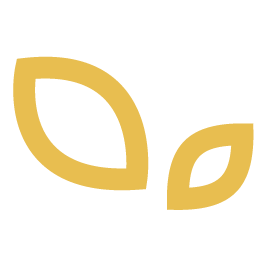 High quality paper is bound together with natural, starch based glue into several patterned layers. This unique material not only makes the Room In A Box Bed incredibly easy to move and ship but it also offers an incredible amount of sleeper support when assembled. The durable frame is more than able to evenly distribute weight and can support a wide variety of mattresses. Durable enough to carry its own weight one hundred fold, the Room In A Box Bed is incredibly sturdy. Weighing in at 10kg, even the smallest frame can sustain 1000kg worth of weight, making the Room In A Box Bed an impressive base. Thanks to the ingenious design and the innovative use of AVANA corrugated cardboard, the Room In A Box Bed can offer a fantastic amount of support, which is fairly extraordinary for a bed that can be made in moments. As European manufactured products, the Room In A Box Bed may arrive slightly larger or smaller than the conventional British mattress sizes, though only by a small margin. Don't worry though this slight overhang will not damage the integrity of either the mattress or the cardboard base. Similarly, some may arrive with additional attachments or as separate bases to create the specified size. For example, a Super King Size 6ft will arrive as two small bases that need connecting together. Any modifications required, such as those for the 4ft small double, are comprehensively explained in the simple to follow instructions provided. For more sizing information, please scroll further down the page. Practical and stable. Construction was so easy! The bed is stable and very comfortable. We're delighted that we can easily transport and rebuild it during our next move. Exactly the right product for my daughter, who's always moving. Everything fits in my car or, if necessary, is transportable by train. And if it has become obsolete in a few years, it can be recycled. The bed is made of the highest-quality corrugated cardboard, which contains at least 70% recycled paper and is 100% recyclable. 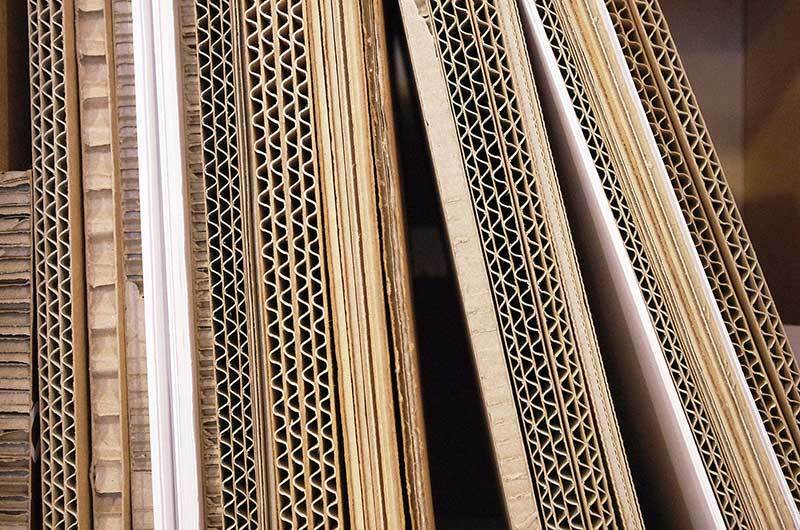 Corrugated cardboard is an environmentally-friendly product made from cellulose and starch (corn/wheat) glue. The paints used for colouring are water-based and non-toxic. Is it possible to paint the bed? Yes. For best results, spread acrylic paint evenly as a thin layer with a small foam roller. How much weight does the bed hold? 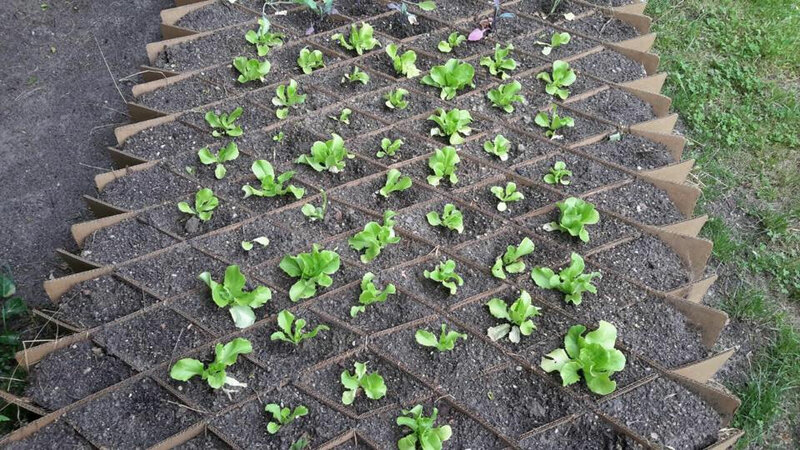 If loaded evenly, our bed holds up to 1.000 kg/sqm. This maximum weight is not affected by how much the bed is unfolded. No, you can just put your mattress on top of the cardboard bed. How do I guarantee good air circulation? Corrugated cardboard is very breathable, and the bed's design ensures that air circulates very effectively. However, to prevent the risk of mould, we recommend maintaining a hand's width gap between walls and the long sides of the bed. How can I dispose of the bed? The furniture can be disposed easily, as you would any cardboard at your local recycling site. Is my mattress suitable for the bed? All mattresses thicker than 15cm are suitable for the bed. If you need a new mattress, you can buy one here. Can I combine two single mattresses on the double bed? Yes. In this case we recommend a rubberised mattress protector between the bed and the mattresses to prevent them drifting. Will the bed slide on the floor? Although it's extremely rare, some very smooth hard floors may cause the bed to slide. If this occurs we recommend buying an anti-slip mat. How durable is the bed? The bed has been rigorously tested to be unfolded thousands of times, and to last as long as a conventional bed. 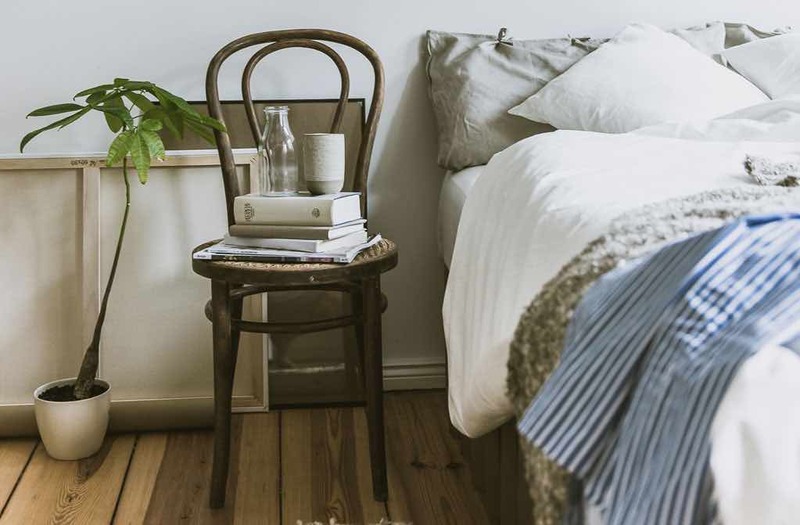 To enable you to get the right size Room In A Box Bed for your needs, we have listed the UK mattress sizes and the corresponding expanded base measurements below. Please note that all sizes of base have a depth of 33cm. Parts: 1 Small Room In A Box base. Parts:1 Small Room In A Box base. Parts:1 Medium Room In A Box base. Parts:2 Small Room In A Box bases that are joined together with the provided additional cardboard connectors. A Medium Firm Orthopaedic mattress with traditional Open Coil Springs and Reflex Foam layer. Fine Damask Cotton fabric with Classic Fillings for a luxurious sleeping surface. Hand tufted for extra strength and durability. Mattress tension: Medium Firm level of support. 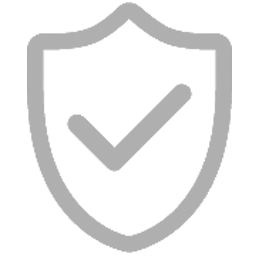 The product is handmade in the UK exclusively by HAPPY BEDS, using the finest materials, conforming to the British standards. sleeping spot, ROOM IN A BOX is your new go-to furniture. you, this bed is set up in seconds. 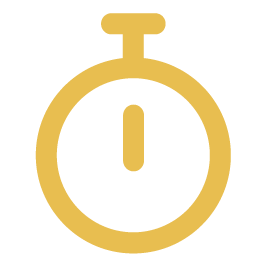 It’s quicker than making a cup of tea. come with a new bed. Go green for sweet dreams. home and say hi to the hygge home trend. call it that) and it looks the part too. These desirable qualities must cause for a hefty price tag, right? a comfortable night’s sleep, every night of the week. your ROOM IN A BOX bed today. Why buy the cardboard bed?